Fair enough. In that case the best I can come up with is to Cast YP/Mentor - copy the token you just created to be a YP/Mentor and then go crazy with token generation? That worth it? On that note - with Beacon and SOL Lands, its pretty easy to do turn 1 chalice turn 2 multicolored 3CMC PW - with Dovin, Tefri, and Saheeli, and anything else maybe even a PW stompy deck that can run chalice and FOW. Dovin has a Stompy mana cost. Teferi and Saheeli? Not so much, due to requiring double colored mana. That's why I mentioned Beacon. Turn 1 Sol Land + Turn 2 Beacon gets you 1(any color)(any other color). So you can cast your double colored PWs. Nevermind, I skipped reading Beacon. But still, most of the best PWs are monocolored with double color requirement. One cool thing about the new Saheeli is getting tricky with lock pieces and mana rocks. E.g., you could turn a random artifact like Ensnaring Bridge into e.g. Grim Monolith, then EoT it turns back into Bridge, thus leaving only your opponent unable to attack AND Bridge untaps normally because it isn't Monolith. Or turning Chalice into a Jitte, attack, grab some charge counters, then alter the Chalice's charge counters to your own liking before it turns back (edit: the original Jitte would die due to legend rule, though). Lots of potential for creative fuckery. People are buying out Aurelia's Fury to try to get a softlock with Feather. This is hilarious. That said, couldn't Feather be used to rebuy Grape Shot if the original copy targets her? Swans of Bryn Argoll would also be on color for ridiculous card advantage. Turn Lightning Bolt into a red Ancestral Recall every turn? Yes, please. At least for Standard, I think people are really sleeping on Grixis/Bolas, Dragon God. There's just an absurd amount of good stuff there, and the use of Lightning Strike over say Seal Away or something gives a huge edge up on dealing with all the incoming 'walkers. New Dovin seems super super good, because he's a big pile of distraction and "not dealt to you" damage vs. aggro, and a sphere vs. control. 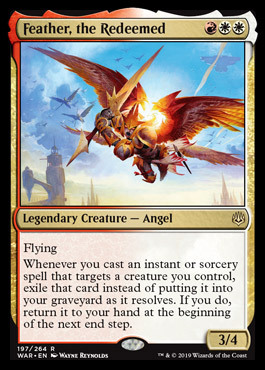 Feather says target creature you control, it isn't specific to her. As for your deck, Karn can only blow up lands or other 0CC cards/tokens. And I'm pretty sure that copying a Planeswalker is fail, as they immediately die from not having loyality counters on them. Going after their lands with both Karn and Dack is pretty nifty, though. is absolutely devastating as they won't ever have more than 1-2 lands in play while also shutting down artifact mana. Absolutely brutal. That's definitely something to work with if you have enough other uses for Coating. Feather says target creature you control, it isn't specific to her..
Arg, sorry - my bad. As for your deck, Karn can only blow up lands or other 0CC cards/tokens. And I'm pretty sure that copying a Planeswalker is fail, as they immediately die from not having loyality counters on them. Going after their lands with both Karn and Dack is pretty nifty, though. .
Edit - Also, my bad, another good catch. So, to expand on the 'Walker Stompy idea, how about 'Walker stax? The real advantage here is that your win cons/lock pieces ALSO draw cards/tutor, and things like Coating creature/Dack steal are effective against permanents, and Karn + Lattice is a hard lock and win condition that can hit turn 3. Maybe some 3Sphere or Sphere of Resistance should be in there somewhere? Might also want the Proliferate land or some stuff like Tabernacle or something, but this feels like a pretty solid start. Probably also want the full 4x Dack and a backup source of card draw/filtering. Perhaps one of the Chandra's? You probably don't need 30 mana sources for something like this either, just spitballing here, but it definitely seems to have a lot of potential. Izzet Signet would probably be pretty good for ramp and mana filtering. 4 CoWs seems excessive. Also, no Bridge? You can stall until Creator Karn has a hard lock via LD or Lattice, then collect cards in your hand to beat them up. Running Creator doesn't mean you can't run Scion of Urza for additional card draw and threats. If you want to go for the Proliferate route, then Walking Ballista should be in there, too. Is there any winning ultimate that you can achieve with the starting loyalty of another PW? The UB Tezzeret, maybe, if you can fire it off twice. I wonder if you guys are doing the math on Ral correctly with Grapeshot. If you untap with Ral, you only need a storm count of six to win. Five if you use his -2. Considering the combination of red and blue acceleration and search, I am pretty sure we are looking at a new deck. Might even be good. 20 damage exactly. Or 19 I think. Am I reading this right? Don’t the copies of Grapeshot each trigger Ral? Is “copy” the same as “put a copy on the stack”?